Beside the Gobi Desert photographing the buddhist cave paintings at Dun Huang. It’s where The Silk Road links China and the west. The paintings are really exquisite, both those on silk and the murals in each of the 500 caves… all preserved just fine by the dry northern air. All flying angels, boddisatvas and buddha. Tara….. she looks nice. 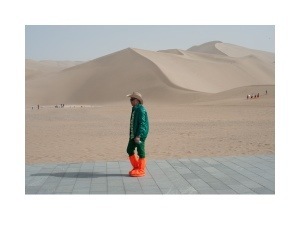 When you walk in the desert they give you orange gaiters to cover your shoes which gives the place and the people some welcome rocknroll… perhaps.